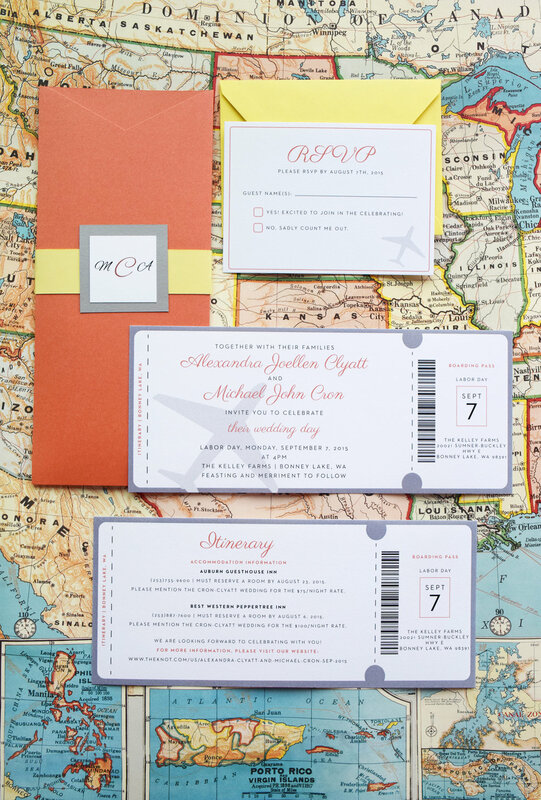 What a perfect invitation for the couple who has a passion for travel! Invite your guests with this unique suite - an old fashioned airplane ticket in a pocket enclosure! Get your guests excited for a destination wedding, or share your love of travel with your guests. The invitation and details card are printed on size #10 cardstock, and includes a traditional RSVP card in 4bar with corresponding sunshine yellow envelope. To complete the look, the pocket enclosure is wrapped with a sunshine yellow band and an emblem with the couple's initials.